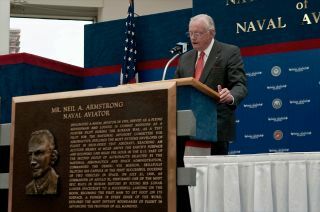 Neil Armstrong gives an acceptance speech after being inducted in 2010 into the Naval Aviation Hall of Honor at the National Naval Aviation Museum in Pensacola, Fla. The Navy will honor him with a burial sea. The late astronaut Neil Armstrong, first man to set foot on the moon, will be buried at sea, NASA has confirmed. Armstrong, who died Aug. 25 at age 82, was remembered during a private family memorial service held in Cincinnati last week. NASA has scheduled a public memorial service to be held Sept. 13 at Washington National Cathedral. The date and details of the first moonwalker's interment at sea have not been announced. The first U.S. civilian to orbit the Earth, Neil Armstrong served as a naval aviator for three years, from 1949 to 1952, before resigning from the U.S. Navy and joining NASA as a research pilot and astronaut. The Navy will perform the committal ceremony. Secretary of the Navy Ray Mabus extended his "deepest and most heartfelt sympathies" to Neil Armstrong's family in a statement released Aug. 26. "Mr. Armstrong rightly belongs to the ages as the man who first walked on the moon, a pioneer of space exploration and science. A giant. But to those of us in his Navy family, he will also remain a shipmate — a naval aviator who flew nearly 80 combat missions during the Korean War. A leader," Mabus said. "He never wanted to be a living memorial, and yet to generations the world over his epic courage and quiet humility stands as the best of all examples," Mabus said. "It is not merely his 'small step' we admire; it is his very large and humble heart." "The world has lost a legend," Mabus said. "We have lost a friend, unique in our lifetime and never to be out of our minds." Armstrong and Buzz Aldrin landed on the the moon's Sea of Tranquility, or Mare Tranquillitatis on July 20, 1969. The moon's "seas," or maria, are not bodies of water but rather basalt plains that were formed by volcanic eruptions. They were name by early astronomers who mistook them to be actual seas. NASA's Sept. 13 public memorial service in Washington, D.C. will bring together dignitaries, community and political leaders, members of Armstrong's family and members of the NASA family, including current and former astronauts, to pay their respects to Armstrong. The ceremony, which will include remarks by NASA chief Charles Bolden, will be shown live on the space agency's television channel and streamed through its website. Very limited public seating is available at National Cathedral on a first-come, first-served basis, with advance reservation.